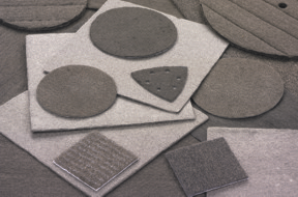 A non woven metal fiber felt that presents unique properties suitable for the production of gaskets. We offer a sintered, porous, monolithic skeletal substrate for gasketing and sealing applications. Thermal Conductivity: Due to the metal properties from which our media is constructed, the monolithic state of the porous matrix, and high surface area of contact at the sealing surfaces, gaskets reinforced with GMT materials exhibit high thermal conductivity through the sealing surface. We have the capability to offer this material in the form of sheets, roll goods, or die-cut to specification. Electrical Conductivity: In certain applications it may be desirable to impart electrical continuity through a sealing surface. The monolithic metallic nature of GMT gasket textiles are perfectly suited to allow for significant metal content at the interface surface and maintain electrical continuity through the gasket. Physical Properties: Sintered metal fiber structures can be as low as 5% density, yet due to the high bond strength between fibers imparted by the sintering process, mechanical strength of gaskets can be increased dramatically. Blowout, creep and tearing are virtually eliminated. Like re-bar in concrete, GMT materials can improve gasket performance by many times. GMT is primarily a raw material supplier and the majority of our volume is shipped in sheet or roll goods form. However, we do have additional capabilities to further process our roll goods, such as slitting, die cutting, forming and light fabrication.